This weekend has been one wonderfully filled moment after another. I got to meet someone that inspires me to keep moving forward and to continue to push myself, I ran my first half-marathon of the year, I tried to meet a goal and have a personal best at the same time, AND I got to watch my group in the No Boundaries reach new heights. So without further delay, lets get started. Meeting an Inspiration: I had the privilege to meet Celeste E. the author of the web blog Confessions of a [former} Fat Girl and her husband Al this weekend. Celeste and I “met” in a FaceBook fitness group called “From Fat to Finish Line”, and I have shared her blog several times. She is an amazing person, and her story is incredible! She inspires me to keep trying my best, to constantly improve, and to enjoy the journey. 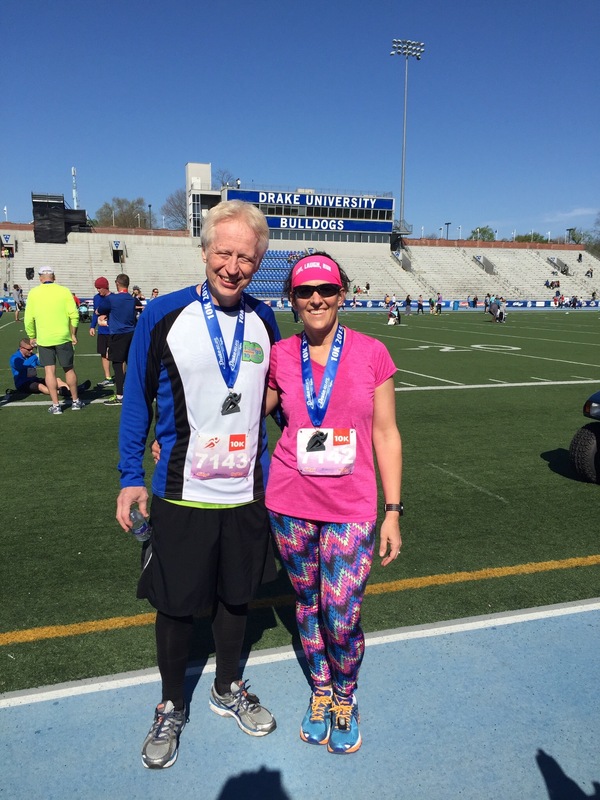 If you haven’t checked out her blog, go to http://confessionsofaformerfatgirlblog.com Celeste and Al were in Des Moines so Celeste could attend the RRCA certification program to become a certified running instructor. How cool is that! 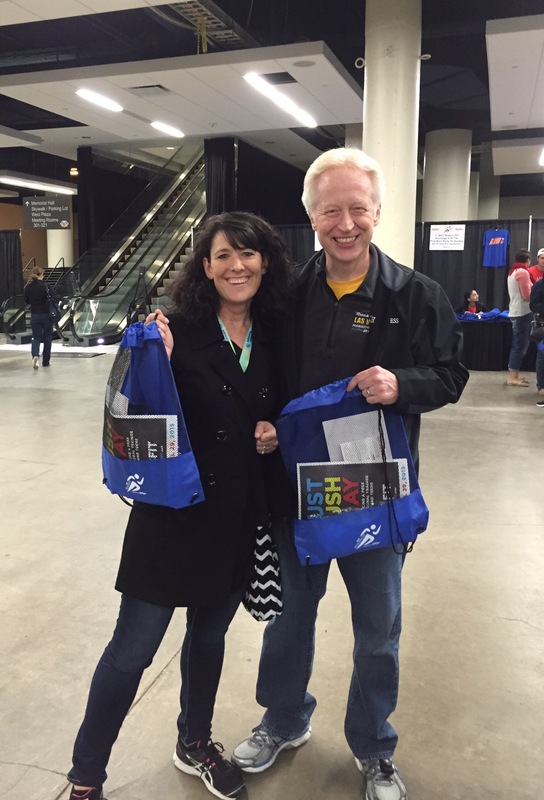 Celeste and Al also signed up to run the 10k event at the Drake Relays. I was signed up for the half-marathon, so we decided to meet up after the training class (I work across the street from the hotel where the class was being held), and walk to the packet pickup. Celeste is an amazing person, and makes you feel at ease right away. We chatted as we walked, and it felt like, even though we just met in person, that we knew each other. I guess having similiar fitness goals and each having a history with a lifestyle change unites people. We waited for Al to find the arena (downtown Des Moines isn’t the easiest to navigate), and the three of us went to the packet pickup and expo. I have to admit I was disappointed with the expo. We were in and out in less than ten minutes. There have been bigger and better expos before, but this one was small. I’m glad Celeste and Al didn’t drive from Minnesota just for this expo. We decided that since we had time before my wife was to meet us for dinner, that we would go to Fleet Feet Sports in the East Village. Celeste mentioned that since I talk about that store so much, that she wanted to see it. Andy Roat and the gang did not disappoint. Both Celeste and Al wished they had a running store like Fleet Feet near them. Celeste tried on a pair of Hoka’s while Al and I picked out Huma gels to try. It was a fun time, and so much better than the expo. After our visit to Fleet Feet, we headed to Fong’s Pizza. Al had researched it, and wanted to give it a try. When we got there however, there was an almost two-hour wait! That wasn’t going to do, so we went across the street to the Royal Mile, and found a table right away. My wife joined us at the Royal Mile, and we ordered drinks and dinner. The dinner was good but the conversation and the company was even better! Celeste and Al told stories about some of the races they have run, including one in full parkas at -15 degrees! They said they had run 50 races last year alone if I remember correctly, and that in itself is amazing! I thought I was doing great at 16 events a year. This is how the experts do it. The time flew by quickly, and before you knew it, we had to say goodnight. Celeste had class and a run in the morning, and I had my No Boundaries group to run and mentor with. So we headed our separate ways, and decided to meet up after the Relays on Sunday. No Boundaries: The No Boundaries group met Saturday morning, and they amaze me each and every week. My group continues to improve in leaps and bounds. Saturday was no exception. They didn’t let a little rain stop them from running outside, and with only a couple walking sections, ran the entire time! They will easily make the Dam to Dam 5k! They say they are learning a lot from me, but I think I am learning even more from them. Andy Roat has given to ok to ramp up the training if they want to, and the group has responded wonderfully. It’s going to be hard to see them go after the program is over, and I hope we can continue to run socially afterward. They are such a great group. 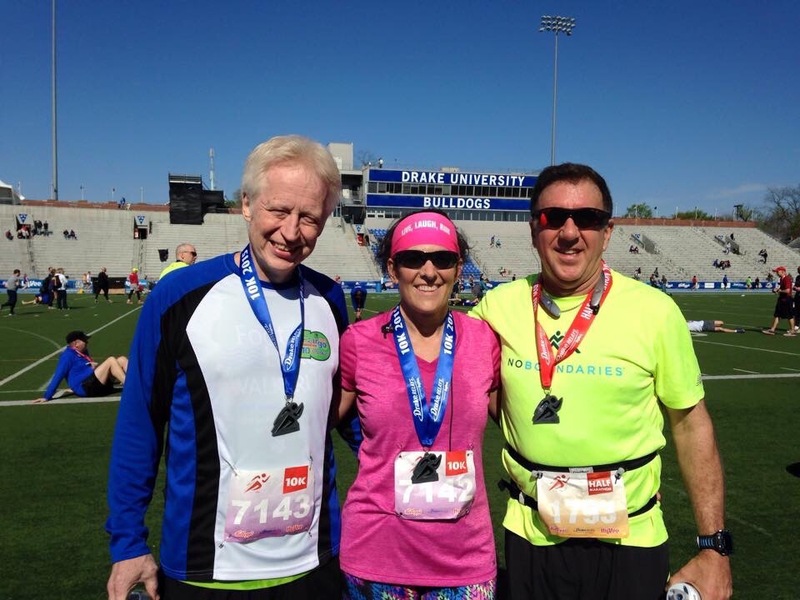 Drake Relays half-marathon: So Sunday morning came and it was time for the half-marathon. I was a little nervous, because the longest training run I had was one 10-miler, along with a 7-miler and others. I wanted to not only finish, but finish strong, because this was a gauge for me on how to train for the Dam to Dam. 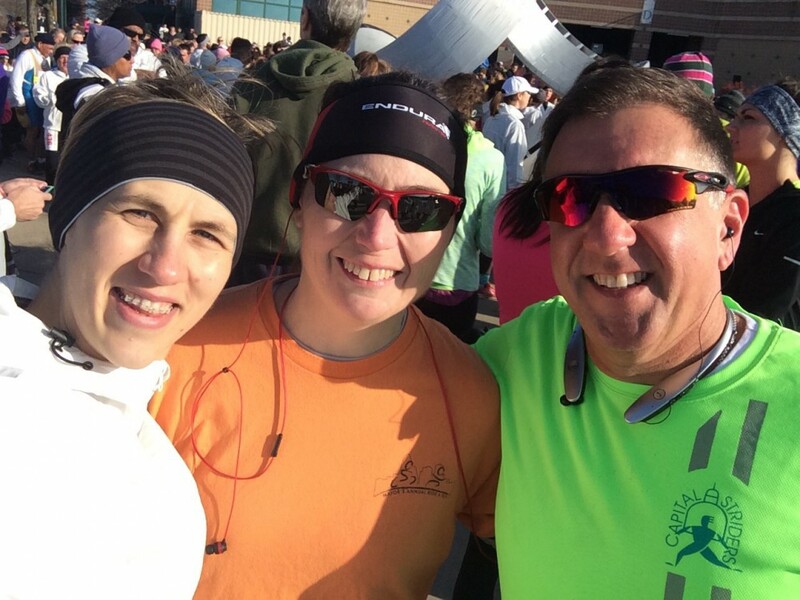 The No Boundaries group decided that the 5k portion of the Dam to Dam would be their “graduation” run, but I had already committed to the half-marathon. So I figured, if I could somehow run the half fast enough, I could finish, find the No Boundaries group, and run the 5k with them. One of the other mentors told me there was a two and a half hour difference between the start of the half, and the start of the 5k. So if I could finish in 2:15, I would have some time to find them. Then I thought that I did a half in 2:10, but it was some time ago. What if I could do the half in under 2 hours? That would give me plenty of time! The goal was set: 1:59:59. So the race started and it felt really good. It was a beautiful day to run! It is always a great route and very well organized. I had lined up in the chute near the two hour pacer. My hope was to keep him in my sights until near the end. Then if I had enough energy to push past him I would. That strategy worked until mile ten, when the hills came into play. We started with a steady incline up Grand Avenue, several city blocks of nothing but incline. I could feel the soreness starting to creep into my legs, and even my toes were tingling. I tried to focus on my breathing, on looking only a few feet in front of me, of just making it to the crest of the hill, because I knew the worst was yet to come. I finally glanced up, and although I saw the next water stand, the 2 hour pacer was gone! I quickly refilled my water bottle and took back off, hoping to use the short downhill and flat to make up some lost time. At the end of the flat I saw the Fleet Feet team. They were waving and cheering me on, and I knew then that, even though I was tired, I could not stop. I would not let them see me fail. But I still could not see the pacer. Once I passed the gang from Fleet Feet, my biggest challenge yet was staring me in the face: Bulldog Hill. The hill affectionately gained the name Bulldog Hill because it leads you back to Drake University, and to the finish. The Bulldog is the Drake University mascot. Runners have other names for this hill, which I cannot repeat here. It is a half mile of torture, a three tiered monster neatly placed toward the end of the run, and you feel every painful step of that hill. The race organizers even time you going up the hill, and give out medals for the fastest finishers. My goal: run up the hill without walking, without letting my friends at Fleet Feet down. It was slow going, my legs were starting to complain, and my body wondered why I pushed it so much. But my brain said “move”, and like a good soldier, the body and legs responded by moving forward. Up the first tier, head down, not trying to look at the crest. Second tier done, still trying to focus on short points to pass, like a driveway or a bush, or even a crack in the road. Anything within my field of vision worked. Then, all at once, the road flattened. I had made it up the hill! Now, if I had anything left in me, I needed to push to the finish. I made it around a couple of turns and looked at my watch. I was less that a mile to the finish, but time was running out. I was three tenths (.3) of a mile from the finish when I saw my watch hit the two-hour mark. My goal was not to be. However, I could still set a PR (personal record) if I could finish before 2:10. When I finally entered the stadium and hit the track, I started to run all out. Now was the time to empty the tank and push hard. Another runner, a young woman, started pushing as well, and we ran side by side as fast as we could. I looked over to her and started encouraging her, saying “Come on, all or nothing! You can do it! Just keep it up! Almost there!” Then suddenly we were across the finish line. I said to her “Great job!” She looked at me and said “I thought I was going to throw up!” I patted her on the back and suddenly heard my name. It was Al and Celeste! They had stayed to watch me cross the finish line. Words cannot express how much that meant to me, as they needed to check out of their hotel, and then drive 6+ hours to get home. Yet they stayed to congratulate me on finishing. That really made me feel as if I had actually won the race! Celeste asked how I did, and I looked at my watch: 2:04:38. 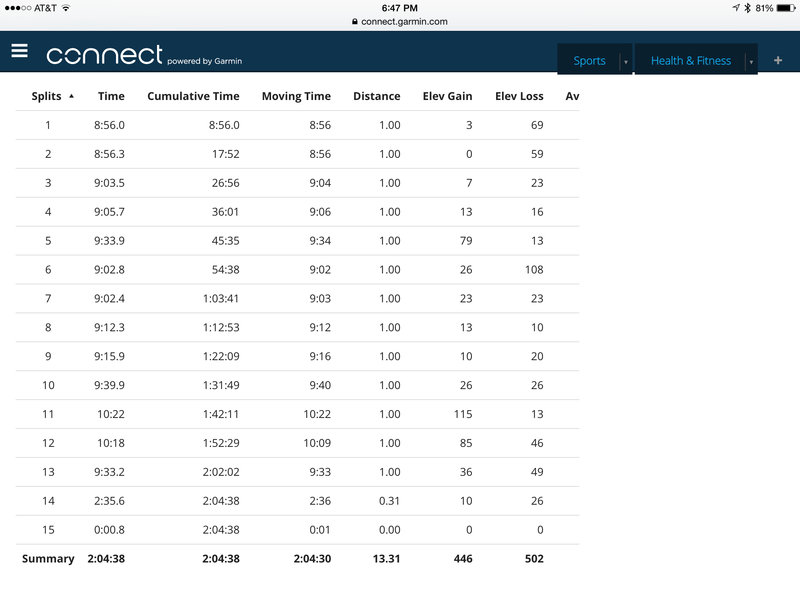 I was able to set a PR by shaving off 6 minutes of time from my previous half-marathon. It wasn’t 1:59:59, but I’ll take it and be happy. Only four minutes behind the pacer. Not a bad day at all! Celeste, Al, and I took pictures and chatted while we hit the rehydration and food line. Celeste mentioned that she wanted to finish the 10k in 1:05, but didn’t do it. When I asked what her time was, she said 1:05:05. Five seconds. She did great! Al did great as well, finishing the 10k in 54:51. It was a great time, but before you knew it, it was time for them to head home. We agreed that we need to run together again at a race on their home turf. I hope for my sake that they pick one during the summer. I don’t know how well I would do running in a parka! So, I finally met someone face to face that I’ve come to admire from her blog, had an awesome time mentoring, ran a nice half-marathon and set a PR. As I was running up the first hill, I thought how wonderful it is that I was blessed to be able do this, that I made a liefstyle change for the better, and of all the wonderful things that have come from it. Who knows what comes next. I can’t wait to see! Its been a while since I posted, and where should I begin? Let’s start with the triathlon training and go from there. I’ve been having issues with swim training, and it felt as if I was regressing instead of progressing. At my last tri-training class, I only swam 75 yards before I had to get out of the pool because I couldn’t breathe. Now, I have asthma from years of smoking, but I have completed the training before without issues. However, the last couple of sessions had me to the point of throwing in the towel and giving up on the idea of triathlon. I told the coaches that I would go to another YMCA where the pool room was larger and more open, and see if that changed anything. If not, I was going to go to the doctor. The coaches agreed, and thought the problem might be the high level of chlorine smell in the pool area. The pool area where we train is quite small with a low ceiling and little air movement. Well I have been to another pool twice, one with higher ceilings and a larger, well ventilated area, and I am happy to say that on the initial warmup swims, I was able to easily swim 250 yards both times! I then did drills until I had 1200 yards in each time. I am hoping that it is the issue, but that means that while I can run and bike with the team, I will have to swim train alone. That’s ok, as long I can keep moving forward, then I’m happy. I also learned that chlorine does affect my breathing. I guess it’s something that I will always have to be prepared for. The No Boundaries group that I am mentoring in is doing very well! My group is picking up speed quickly, and their distance that they cover from one week to the next is amazing! I am so honored to be a part of such a wonderful group of people that want to run and improve their lives. One member has a hurt foot, possibly a broken toe, but she is not letting it stop her! She is taping it up and still going, even though we have agreed that she should rest it. She is amazing, but I don’t want her to hurt it worse. Claire is one of the No Boundaries coaches, and she has been wanting to increase her distance so she can run a half marathon. We have went on a few runs, and it’s a lot of fun to run with her. She’s upbeat and funny, and we chat a lot during our runs. It makes the time fly by. We even met up for a 5 mile run before our mentors meeting on Friday, and I had a great time. We even stopped long enough to take a picture of Gray’s Lake. Isn’t that beautiful? It was a great run and a great evening! I can’t wait for our next run. Until then, I guess I will keep cramming in all that I can. It’s hard to believe that a few years ago, I didn’t want to exercise. Now people are asking me for advice, tips, and techniques. I still feel like such a newbie, and yet people are telling me how I am helping and inspiring them. It just warms my heart to hear that, becuase it means that I touched someone, and that’s what life is all about: helping others.